Corrections officers say criminals are using drones to smuggle contraband inside facility in Southwest Miami Dade County. 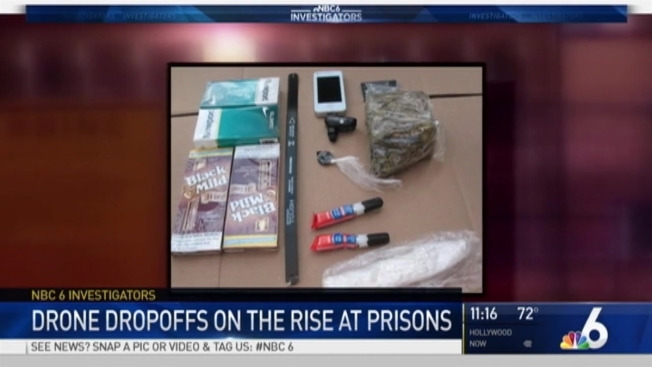 Smuggling contraband to a prison can be a creative enterprise. And with today’s technology, drones have become another way criminals have found to smuggle contraband into prison. Corrections officers at the Federal Correction Institution in Miami believe it's happening there. “Basically, we have drones that fly over our institution,” Sam Catchings, the head of the local union for corrections officers. "A person actually crashed their drone in the back side (of the facility). At the federal facility next to the Miami Zoo, about 1,500 inmates are serving time, some of them are considered to be violent criminals convicted of murders as well as being gang members or having terrorist ties. The use of drones to smuggle contraband has been seen in other parts of the country. In Oklahoma, a drone crashed at a prison. It was carrying hacksaw blades, heroin and a cell phone. And two men were arrested in Maryland before they were about to fly their drone over the prison wall to deliver drugs to an inmate waiting for the loot. Orlando Villaverde, an aviation law enforcement expert, said the drone flights over the prison grounds are a coordinated effort. Union officials said they voiced concerns to FCI-Miami officials. The prison’s associate warden said in a statement, "Specific information regarding drones being flown near or over the facility has not been reported to institution management." The statement also said that drones delivering contraband to state facilities has occurred in recent years but described it as a “limited threat” at federal prisons. Regardless, Catchings hopes something can be done to limit the threat. “If anything they should have a no fly zone over a federal prison or a state or county prison,” he said. The NBC 6 Investigators obtained photos showing an array of items the correctional officers are finding inside smuggled by different means. One item discovered is shaped like a gun that's designed to pick locks. Officers have also found master keys to open doors hidden in speakers, weapons, drugs and cell phones. “If an inmate has a cell phone they are able to make any kind of hit on a judge or make a hit on staff members, which we actually saw done in Puerto Rico,” Catchings said. He says a Miami inmate was involved in a scheme that killed Corrections Officer Osvaldo Albarati. The hit was made on a cell phone call. A phone allows inmates to continue their criminal activities from inside the prison,” he said.